I have such a treat for you guys today! You may already know Kelly and her fabulous blog but if you do not...you will now. This girl is nothing short of a powerhouse of talent. She is crafty and a complete design genius (a girl after my own heart), her photography is breathtaking, a total fashion savant and she is beautiful from the inside out! Today we are swapping interviews and I can't wait for you to meet her! She is truly AMAZING! How beautiful are she and her husband? Don't they look like models? Good gracious..I miss my youthfulness. This is more what my husband and I look like in a photo and without the intended distortion. Yet somehow these 2 beautiful people pull this one off too. I see my blog as a creative journal of my work and life. 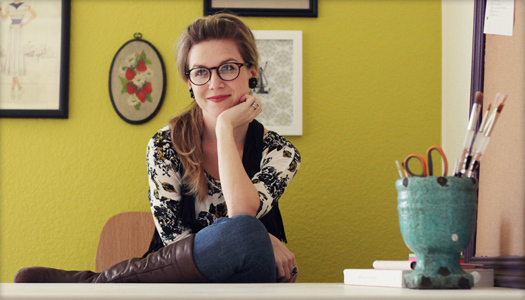 The work I feature is a combination of freelance design projects, home projects, DIYs, photography, and personal art. But I also love that my blog has become a place for sharing life tidbits, inspiring myself, and improving my craft. Finding the time! If I could blog everyday, I would. I do my best as a blogger to update frequently and to post quality content but at times life and commitments take over. I'd like to think I'm pretty funny, but maybe fun to be around better describes me ;) Typically I'm optimistic about life and try to make the best of out every situation. Beyond that I would say I'm creative, determined, organized, thrifty, hopeful, and silly. I strive to follow after the Lord everyday and base my decisions on the faith I have in Him. Through encouragement. I have gotten such sweet notes from girls saying they have been encouraged in their walk with the Lord through my blog. It's amazing to think my blog could be used to bring glory to God's kingdom. My hope is that I could use my talents to honor God and show others to use their own talents. The Lord has given me encouragement and validation when I read those notes to keep pursuing my dreams! I sneeze almost every time I go outside. I was ordering a mango smoothie but it came out mango boobie. My friends thought it was hilarious and of course so did the barista. I turned bright red and the whole night I heard "I'll have a boobie smoothie!" Today it was the girl next to me on the plane who wrote a list of recommended restaurants for the stranger behind her. She overheard the man behind us saying he had never been to the destination we were going so she wrote a whole page of restaurants for him. I thought it was such a thoughtful gesture and one I wouldn't think of. It inspires me so much when I see others go out of their way to be kind. Even though this particular incident had nothing to do with art or design, I love the idea of art inspiring thoughtfulness. Fresh-squeezed lemonade. Even better when it's raspberry or strawberry lemonade. I live in Rochester, Minnesota, the town I grew up in. I don't live in the most exciting of places but the city is expanding. My must go-to restaurant is Chester's which has a cool atmosphere and awesome salads. I've recently been exploring all the thrift stores in town and the best one I've found so far is All in Vogue - it's huge! 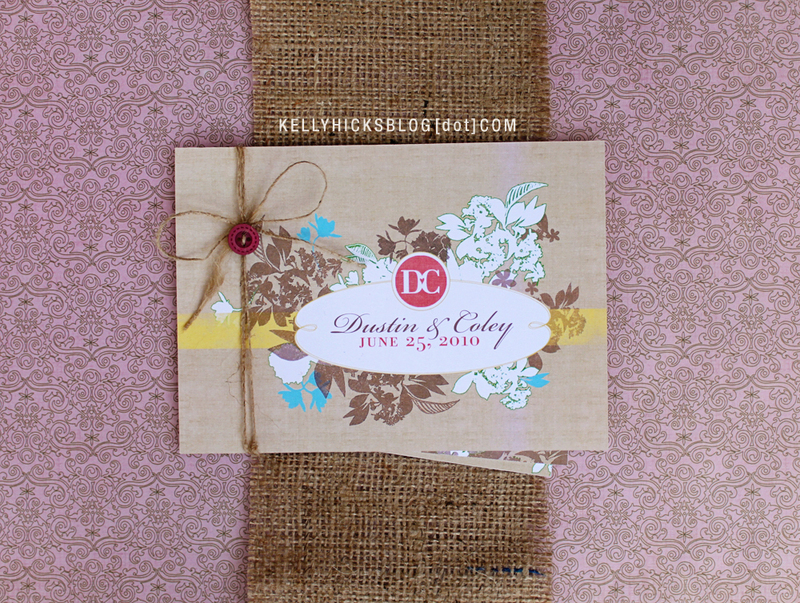 That is a tough one but I think my favorite project has been the first wedding invitations I ever designed: http://kellyhicksdesign.com/2010/04/bright-vintage-y-wedding-invites/ The relationship I had with my bride was so great because our visions lined up perfectly. I was immediately inspired by what she told me about her wedding and the inspiration she shared with me. A good working client relationship always makes a project better! Yes, a rope is always better. For example, when you find yourself in a sticky situation of having to tie one end of it to a large fallen tree trunk and the other end to the back of your whimy Sonata. My husband and I found ourselves in this predicament. We drove 3 hours to a remote lake lot, it was getting dark, and we discovered a massive tree right across the driveway to the lot. We knew we still had to set up camp and were not about to drive all the way back at 10 at night. So we did what anyone would do with rope and that little Sonata pulled it right out of the way. You could say rope saved our lives. Isn't she just sweet and so refreshingly funny! A breath of fresh air and such realness from an incredibly talented woman. Now you must go visit sweet Kelly and her fabulously inspirational blog. My interview should be up too so maybe you can learn a few things you did not know about me too! What great ideas and great interviews! I enjoyed reading both, and thanks for sharing. Jessica, thanks for your kind comments. I was certainly surprised when I read your blog. It made my day special. I ham having difficulty walking now but I would love to dance with you at a flash mob! God bless. Love this today....off to take a visit! Hugs for a happy weekend.